We will use one Digital Input, one Analog Input, One PWM Output and couple of Digital Outputs. I will not go into much details as to how to use the inputs and outputs as if you have reached this stage, then you probably know how to program inputs and outputs and the way they are connected to the ESP8266. All the components are basic so you should easily have it. 1) Digital Input: Pin 4 of the ESP8266 will be used as a digital input. This means that pin 4 will sense a 1 or a 0 on the pin. Depending on the input, the text of the output on the web page will change asynchronously i.e. without page reload. For this purpose, we will use a simple push button switch. When pressed, the output will be OFF as it is connected to GND and when released, the output will be ON due to Input Pullup. 2) Digital Output: We will use LEDs connected to pin 12 and pin 13 as output. Depending upon the input we provide to the ESP8266 via the web interface, the LEDs will be either ON or OFF. Also, the text below buttons 12 and 13 will be either ON or OFF depending on the actual state of the LEDs. 3) Analog Input: ESP8266 has only one analog sensing pins denoted as A and used in IDE as A0. We will connect an LDR to it. This will give varying values depending upon the brightness around it. The Analog input is limited to 1V so you to scale down the analog signal accordingly. 4) Analog Output: We will connect another LED to pin 5 of the ESP8266. The way ESP8266 provides analog output is through PWM which means when we change the value of the input on the web interface, the Duty cycle of the Pulse Width Modulated signal changes hence giving the effective output of analog change. When we change the slider on the page, the brightness of the LED will change. The Web Interface consists of either user input to the ESP8266 or change in the status in web page depending on status of pins. Analog Input: The text box field will reflect the values of the Ambient Light brightness in Lux. Digital Input: This value will change from Off to On depending upon the status of the Digital pin 4. PWM Output: PWM output from a pin has a value ranging from 0 to 255. The slider sets the value of Pin 5 from 0 to 255. Also, the text below it shows the current value of the output. Digital Output: We have used Pin 12 and 13 as output on ESP8266. The output will change depending upon what we do to the GPIO 12 and 13 on the page. If we click the button once, the output on the pin will toggle to digital one and the button text below will change to On. Click once again and it will toggle the pin to digital zero and reflect the change on the page by turning button text Off. You can find the INO file here and the library file here. Opening and saving the INO file will create a folder for itself in Arduino folder. You will have to copy the folder indexl (containing the indexl.h file) in the Arduino Libraries folder. The HTML code is present in the indexl.h file in a format which can be understood by the ESP8266. We will take snippets of the code and discuss it here. First we will look into the code that makes the page. We will not go into the details as to the formatting, just the things which form part of the interaction. This is the text box below “Ambient Light in Lux”. The important thing to note here is the id and the value. The script requires that we have an id and a value so that we could reference it into a script and change its value. This is the text below GPIO 4. The current text is On but as soon as the script will run and the status of pin 4 will change to 0 depending on push button press, the text will be replaced by Off. The script will reference the id of text4 to change the text. These codes are representing the GPIO 5 slider. The first field is hidden which means you will not see anything about it but it is important because it has a value and an id which will be referenced later. The second line is the code of the slider as depicted by the input=range. The starting value is 0 and the ending value is 255 and the step is 1. 0 to 255 represents the values PWM can take. Also, moving the slider will cause an event “sendDAC” which will send the current value of the slider with the value of pin5 to the script. We will discuss the scripts later on. valueDac5 (the number below the slider) currently has a value of 0 but will be replaced by another value depending upon the output of the script. The code above represents the Digital output pin 12. The first line represents the value of pin12 to be referenced later. The second line represents the action that will be taken when we click the button. The action will be either 0 or 1. Initially the text below the button will be Off as the value of action12 is 0. Later on, the text will change to On as we click the button triggering the event “sendbutton” which sends the value of pin12 and the value of action12 to the script. There will be many times we will get response from the ESP8266 and we will place that in the id description so that we can see the communication. The timeout on the script causes it to run every 4 seconds. You remember the description field in the previous section at the end. That description will be replaced by “Processing Status” in the page by the innerHTML attribute. The “request = new XMLHttpRequest()”creates a new request and on a state change, it calls another script “updateasyncstatus”. “request.open(“GET”, server, true)” creates a GET request with a value of server which in total amounts to “http://ip address of ESP8266/status/99”. Also, the true indicates that it is an Asynchronous request which means the page will not required to be reloaded. “request.send(null)” sends the created request to the ESP8266. The script updateasyncstatus updates the state of the page i.e. all the parameters we were talking about before – the text, text boxes, the sliders, etc. The response we receive from the ESP8266 will be of the format status#4=1#12=0#13=0#5=0#A0=756. What the result.split will do is split the string at “#” into an array of “pin and its value” pair. So the array will look like 4=1,12=0,13=0,A0=756. fullset will store this array and you can call any entry based upon fullset[position of entry]. In the following “for loop”, we will further segregate the values to make them usable. The for loop will run as long as the length of the response received. document.getElementById(ActNum).value = PinAct” will change the value of action12 in main HTML to 1. What this will do is the next time when you click on GPIO 12 i.e. pin12, it will send a value of 1 as currently its value is 0. This makes it a toggle switch. “document.getElementById(TxtNum).innerHTML = text;” will change the text below button 12 to be Off as pin status is 0. In the case of pin 4, since it is not a toggle switch, we do not require PinAct. If Pin status is 1, text2 in the HTML will be replaced by On and vice versa. PinVal = parseInt(singleset); //Since pin 5 is analog output, it has values between 0 and 255. This integer value will need to be extracted from the array using parseInt() in order to be usable. AJAX request will be created and sent as “http://ip address of ESP8266/digital/12/1 to ESP8266 and updateasyncbutton script will be run. updateasyncbutton script will process the response coming back from ESP8266 i.e. in the form of digital,12,1. The above code creates and sends a request to ESP8266 as “http://ip address of ESP8266/dac/5/190 and runs script updateasyncDac. What this function does is change the value of slider and the value below it. This entry was posted in Internet of Things and tagged AJAX, Arduino IDE, ESP8266, HTML, Input, Output, Web by samirsogay. Bookmark the permalink. Do you have the esp8266 package installed in arduino IDE? I have downloaded but not installed completely. Do you thing is the problem? By the way, thanks alot for you invaluable help. Best regards. Dear Samir thanks alot for your help. I tried everything in the links. But I have still the following message coming from IDE during the upload. It cuts without upload to the Arduino Mega. SO NO UPLOAD TO THE ARDUINO MEGA. What need to be enabled on my PC ? There is no reason it should not work on chrome. When in chrome, hit F12 to see whether any errors are generated when you click on buttons. I’m a nob when in comes to Webstuffs, and while I can get your project running on my ESP-01 I fail to map my outputs correctly. Are you able to give a very simple example where you have a static weeb page that controls one GPIO pin on button click? I am an absolute NOOB but managed to successfully upload this ESP01 example with help of your tutorial. Many thanks for your work! I have an ESP01 with only the GPIO2 and GPIO0 available. Can you please point me out how I can use one of these as an input (button) and the other one as an output (LED). I’m trying to change the code but I’m afraid that I will mess everything up. Is it in the INO file that I need to change things or in the indexh?.. Let’s say I want (what is now) the Digital Output (pin 12) to be an output on GPIO2 and the state of Button should be visible while connected to GPIO0 ? I want to learn but I don’t want to mess everything up.. It is possible to modify only the INO and make it work for your requirement. I suggest you to reverse your requirement as GPIO0 is a special purpose pin which helps esp8266 to go to firmware boot mode when held low so it is best to keep it only as output. GPIO2 can be input. You can modify the pin number 12 in sketch to GPIO0 for digital output and pin number 4 to GPIO2 for input. Dont change the pin 12 and 4 in the command URL as this corresponds to the HTML code. So even though the HTML will request pin 4, use the trigger to switch GPIO2 by mapping 4 in url to GPIO2. Thanks for your suggestion on the ESP01. You work with the Huzzah module? This has the same pinout as the ESP12? I tried your suggestion with reversing the GPIO’s. But only changing the pinnumbers in the INO file does not work. I’m searching if the same pinout is used for the ESP01 as ESP12. I think that the scripts works only if the same connection is made on the board and the chip? So I need to make sure that for instance GPIO0 is the same on the ESP01 as the ESP12. Then, something tells me that I need to edit the indexh file too? The script sends a line of code with the pin number that is used in the INO file too. The pin number is extracted from the line that is send and used as a command to the chip? I’m sorry for bothering you with this, but the more I look into this the more confused I get. The proper way to proceed would be editing the indexh file and make corresponding changes in the INO. Basically its just a mapping. What matters is the digitalread and digitalwrite in INO at the proper pinout. Talking about pinout, I have used all 3 Huzzah, NodeMCU as well esp01. Whatever you use, the pinouts labelled on the board will correspond to the GPIOs. I’ve managed to get the “ESP01ippdutoggle” example working and this feels like heaven. Thank you a thousand times for this code!! But my brain is rusty, I feel old because I can’t manage to get the “esp8266_web_ajax.ino” working on an ESP01. The thing is that I want to edit this file to get 1 output and 1 input visible on a webpage. Nothing more. So I started editing the “esp8266_web_ajax.ino” file and the “indexl.h” in all kinds of variations but I don’t seem to get the right settings. Is it please possible to show me the way? In the “esp8266_web_ajax.ino” example I would like to see GPIO 0 or 2 as an input (you preffered 0 as an output), and one of these two as an output. What do I need to edit in the code? "TxtNum = \"text\" + PN;\r\n"
"ActNum = \"action\" + PN;\r\n"
Not able to paste code properly. use the image linked. I’ve been trying to get it work, I get a webpage but when I push the button, it doesn’t reply. I’m more an hardware guy so the code is the most difficult in all my projects. Could you please have a look at the code I’ve got and help me with it? My last question for you, and them I will never ask you anything again. Is it possible to adapt the ESP01ippdutoggle file in that way that the slider is gone and replaced with an INPUT from GPIO2? I find on my IOS phone the page displays but doesn’t update the analog values and the GPIO wont toggle etc. Within IE11 everything works perfect. Do you have any idea why? Sorry, you probably should ask an HTML expert. I have tried to download the files from your dropbox but i am unable to do so. Could you re-share them? I have rechecked the links and they are working. If it still not working, message me through the about me page and I will mail you. I could not directly download them. I sent them to my personal dropbox and downloaded them there. Hi, it’s an excellent work. I want a change with the push button operation so the led GPIO 13 goes to HIGH if is it LOW or LOW if is it HIGH. Can you suggest the changes in the code ? Any idea is very helpful. one of the functionality I am looking for is to make a graph in Html, have you came across ? Do you have any idea how to make a graph in your webserver without using any internet connectivity to outside world for api. There is a software called converthtml.exe which will convert your page to be usable in an esp8266. As far as the graph is concerned, I did see an example in arduino IDE but i am not able to find it. It was either in ESP8266 or Arduino YUN examples. the program is working fine, both on my phone and PC. I want to put more function on the page and I can’t get it. For example I have a DS18B20 temperature sensor and I can’t integrate in the page to show the temperature. I made just to show in the status line at the end the temperature. Now I want to have it in the table, new row. My reading function is getTemp(). Client.println(getTemp()); just show the temp in the line. Can you help me to make it working in the table? You might have to take help from someone who knows HTML well. If you can give more details, maybe I can. Wow. I’m working on a simple project that is different than your specific project, but the very big amount of work that you put in will make my project AWESOME! I really appreciate the information on this page. If all goes well and I can manage to modify everything to my liking, I will be posting another comment describing my modifications. Check if there are any errors on the page. F12 on chrome browser will show the errors. Firefox // Ореrа // Us br // does not work, just a table with buttons, on native win7 / 64 explorer, works partially there is no appearance of smooth scrolling of the slider. It’s just incompatibility. You just checked on Chrom and everything ?? I’m trying to make several “Range” Dac controls work with your code, but I’m not getting it. Can you help me ??? I tried several ways, and although I can control the brightness of the led, I can not load the page of the 2nd and 3rd “Range” with the value set. they always go back to zero. The 1st Range is working. Thanks in advance for any help, your code has helped me a lot. !!!. Basically for the 3 DACs, you will have to make your HTML code such that it will have 3 sliders then they can call senddac function according to slider position. You can concentrate first on whether the slider is actually working then you can parse the URL from arduino to update web page after that. You are being asked to login because h3lyorod@gmail.com is used by an account you are not logged into now. Hello again friend Could you tell me if there is an error in the code, because after about 5 or 10 minutes it locks completely and I have to restart the ESP12E / WEMOS D1 R2. Then I have to reset or restart the board. Can you tell me what I can do to prevent this? PS: With other codes the wifi works 100% and never hangs. I haven’t used for that long to check whether it is hanging. Try minimizing the code (keep only the things which is required) and see if it makes a difference. Hello, i am having some troubles on my code. I would like to build a wifi thermostat ( temperature controller ) using nodemcu lolin esp8266 12e and i can’t build the following scenario: when i click a button i want that Tref1 to decrese by 0.5 and when i click another button, to rise 0.5. it is like a button without feedback parameter. I didn’t exactly understand your code. As you are having 2 buttons, there should also be 2 different parameters you should be sending. Lets say one parameter is increase and another is decrease. In the arduino code if you have a default temperature then if the parameter you receive in arduino code is increase then increase the value of temperature by 0.5 and similarly for decrease. let the arduino code do the calculation rather than html. I am assuming you are not sending temperature value from HTML. Thank you very much for sharing this sketch. It’s the closest I’ve found to what i need. The status monitor on GPIO4 is unique amongst all sketches Ive seen in this category (Wish there was a simple way to show “on” time for that pin). It will be used as a basement sump monitor for my Dad. I am a total (67 year old) noob trying to wade through this new found passion. My problem is the ESP8266 requires frequent resets… From a few minutes to a few hours. I’ve used different routers, assigned static IP and eliminated all possible sources of RF interference. 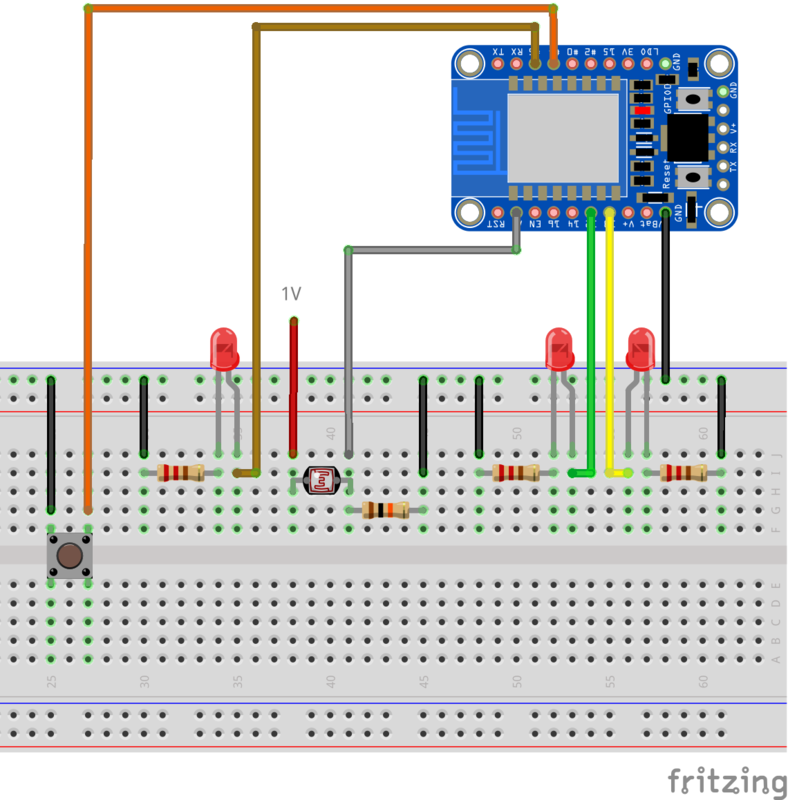 I’m so intent on using this sketch, I’ve connected a second ESP8266 NodeMcu, using a sketch with a momentary switch, to the reset pin on the first one. This works, but I’m hoping for a better solution. Any help would be appreciated. Good to hear it has been useful to you. There are a few things you can try. Try adding WiFi.mode(WIFI_STA); in void setup and see if it makes any difference to the stability of the esp8266. Also, you can remove all unwanted code from the sketch. ESP8266 has single processor which processes the code and also does wifi, so if the code is too heavy wifi can disconnect. If your code is already optimized then you can experiment with esp32 which has dual core so one core can process the sketch and another can do wifi. For the ON time, if you are good in HTML, then you can show the time for which the button was ON OR You can have a variable store the time at which pin went high in arduino code and send it every minute to the HTML page. Hello, Thank-you for this nice example. It look to work well. I’l can upgrade some application and migrate they to AJAX. I need a 30-300 sn on off time adjustable four channel timer relay using ESP12E. Could you help me? Thank you. I have a similar code and you can modify to your requirement.